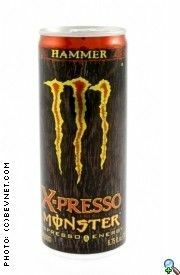 Monster Hammer Xpresso was a "nitrous" addition to Monster's Coffee flavored drinks. This one used Nitrous Oxide to obtain a froth on top when poured. However, Moster Hammer Xpresso is no longer in production. It had the same energy blend as Java Monster but with added espresso. Consumer reports tested Xpresso and unlocked the caffeine amount. How Does Monster Hammer X-presso Compare? Monster Hammer X-presso contains 32.74 mgs of caffeine per fluid ounce (110.71mg/100 ml).